Bahama Bay Resort & Spa is the perfect place for your special family vacation in Orlando. This spectacular first class resort with tropical island themed condos is located in the heart of Florida, only 10 minutes from Disney World, near Universal Studios and Sea World. 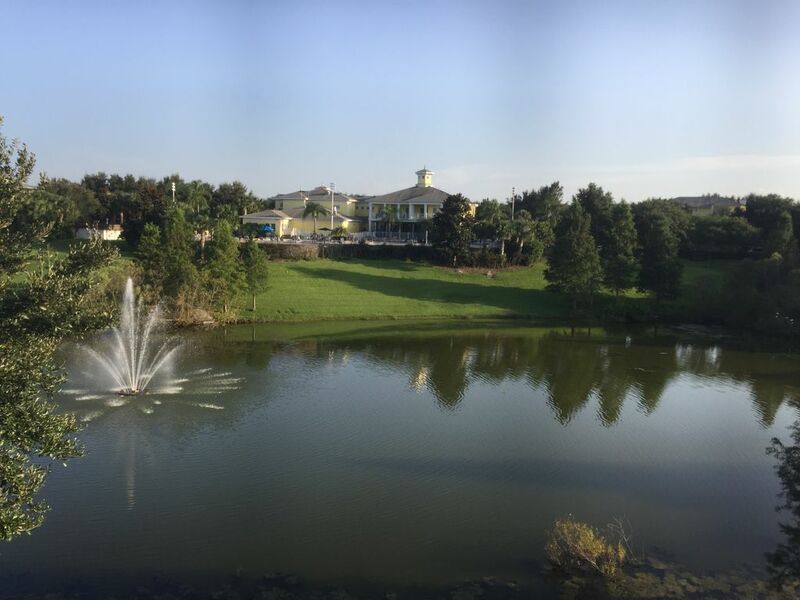 The Bahama Bay Resort is set on the edge of a stunning Lake Davenport with its private sandy beach that extends into 70 acres of lush tropical gardens. Extensive leisure activities both adventurous and relaxing, for adults and children alike means Bahama Bay offers a unique holiday experience that will capture the hearts of all ages. Our vacation rental condo boasts 1739 sq ft and is the largest condo in the resort. It has an amazing location with beautiful waterview. It is beautifully island-theme decorated and also very well equipped. Master bedroom boasts king size bed, large walk in closet and huge master with large shower, large corner bathtub and double basins. The second guest bedroom is queen and enjoys lovely water views and has it's own private balcony. Third bedroom is twin. There also is a sleeper sofa in the living room. For our little guests we have couple of playpens, highchair and crib. The kitchen has been recently updated with modern appliances and is perfectly equipped for indoor dining. You have two option for dining in, either in our lovely dining room or on the large screened balcony with waterview. It is a perfect place for wonderful family and friends vacation where unforgettable memories are made. We are a family who love Florida. We go there every year and we are very happy to rent out our beautiful condos for the rest of the year. I am an automotive engineer by trade and enjoy my job. Still I would rather be on holiday in Bahama Bay Resort. It is a second home for us now as we have been there so many times. We have 3 happy children who love Florida. Excellent location to Disney and Orlando's attractions yet located in a very peaceful location away from the hustle and bustle. Our condo enjoys one of the best locations in the resort with lovely water views. Our condo is located between the clubhouse and the beach. Our balcony overlooks the man made lake with fountain in it. At night you sit out on the large balcony and listen to sound of the fountain and bull frogs. Its really relaxing and nice. Wifi is free and works in the condo. We enjoy an oversized balcony with amazing view and dining area. We take pride in our units and ensure they are regularly upgraded. We have extra parking right outside our unit so theres always a space to park in close by. sit on the balcony and relax listening to the fountain in the middle of lake. All bedding included, towels included. We had a great vacation! Love the pool and restaurant. The only complaints are that the rug and the bed blankets could have been cleaner. The place was so spacious and loved the screened balcony. Would have been nice if we were told we needed to bring our own garbage bags, toilet paper, dish soap etc. so come prepared. But the place was beautiful, definitely had the Bahama decor a bit outdated to some but I liked it! Will definitely book this one again. Enjoyed the condo and the property and great location, close to all theme parks. We had a wonderful time during our recent stay; convenient to everything. We had a great stay! Our accommodations were excellent! Location was perfect. We had a great time! Thank you!! We've just returned from a 17 night stay, this was our third time at Bahama Bay and the first time in this apartment. The accommodation offers great value for money, plenty of space, we were a party of five and there is plenty of room to get away from each other! The apartment has everything you need, plenty of towels for the pools and nice outdoor seating in the screened patio. Great washer and dryer so no need to bring laundry home. If I was being very picky some extra crockery would have been good. The pool at the club house is nice but we prefer the one by Tradewinds, nice and relaxing by the lake and the bar there offers good food and drink at a reasonable price and friendly service, and is only a short stroll away from this block which is a great bonus. We enjoyed meeting other visitors there and the kids enjoyed meeting new friends too. The owners were very easy to book with and helpful with enquiries we made. Fabulous Bahama Bay Resort gardens consist of lush tropical, landscaping with recreation areas, 17, 000sq, ft, Bahama Bay Resort Clubhouse & recreation centre, including, - Mambos poolside bar & grill & snack bar, - 5 large heated pools, 7 whirlpool spas, - shop / DVD hire / Free coffee, - recreation area/ fully equipped fitness centre / Sauna / SPA/, Facial / Pedicure / Manicure rooms Hair Salon, - kiddies pool and play area, - children play room, - Lounge area / reading area, - Resort pool tables, - Resort Conference facilities, - Internet room & game room, - 5 Star Restaurant & Tikki beach front bar, - Tennis Court / Basket ball court, - Volley ball, - Sandy beach by the Lake Davenport, - Fishing Dock & Jetty, - 24 hour manned gated resort security, - Water features throughout the Bahama Bay Resort. Our rates start from $79 and depend on dates and length of stay. Please contact us for a quote.